Food artist, Michelle Wibowo, 39, from West Sussex, has unveiled one of Roald Dahl’s most beloved characters; The BFG, made entirely from Mr Kipling cakes. Sitting on a bench at the top of Primrose Hill, The life-sized BFG measured a ‘gigantuous’ 7.32 metres tall from head to toe, four times the size of a human. The ‘splendiferous’ sculpture was built using 7,500 Mr Kipling cakes, weighing a whopping half a tonne and took more than 200 hours to create. 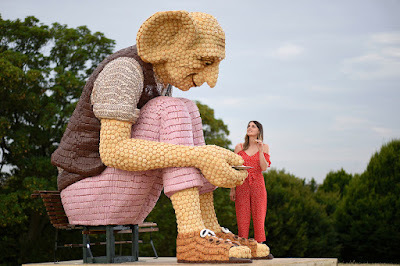 Built to celebrate the new limited edition Mr Kipling and Roald Dahl range, The edible BFG was enjoyed by families and passers-by, who gazed in amazement at the ‘scrumdiddlyumptious’ Mr Kipling cakes covering his entire body. Mr Kipling has launched four new, delicious cakes for families to enjoy this summer, featuring Roald Dahl’s iconic characters and beloved stories on the beautifully designed packs. The range includes The Enormous Croc’s Mud Pies, The BFG’s Strawbunkle and Cream Fancies, George’s Marvellous Lemon & Raspberry Whirls and Mr Fox’s Fantastic Forest Fruit Slices. The Mr Kipling Roald Dahl limited edition range of cakes is available in all supermarkets nationwide until 11th September.